Mount Erickson (2670m) from the summit of Phillipps Peak. After a busy couple of months, I was looking forward to getting out and up another mountain. 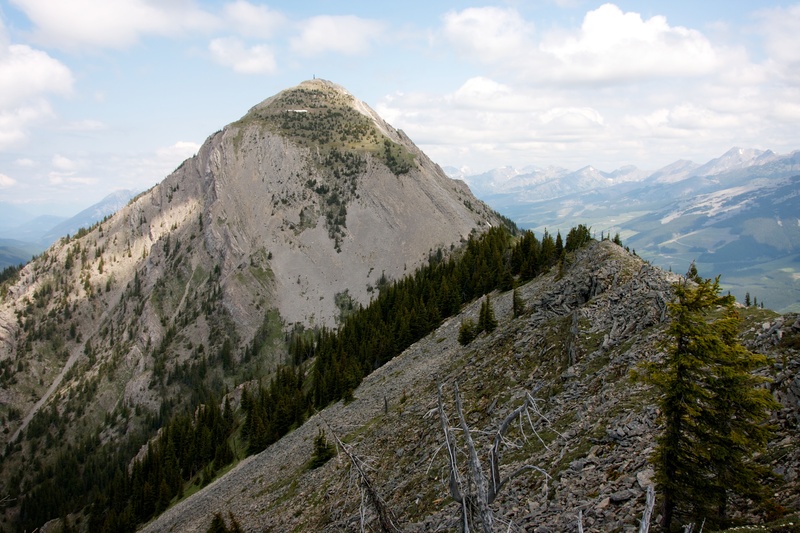 Since Mount Erickson had been on my radar for quite some time, it seemed like a logical choice that would add to my ongoing exploration of the region. 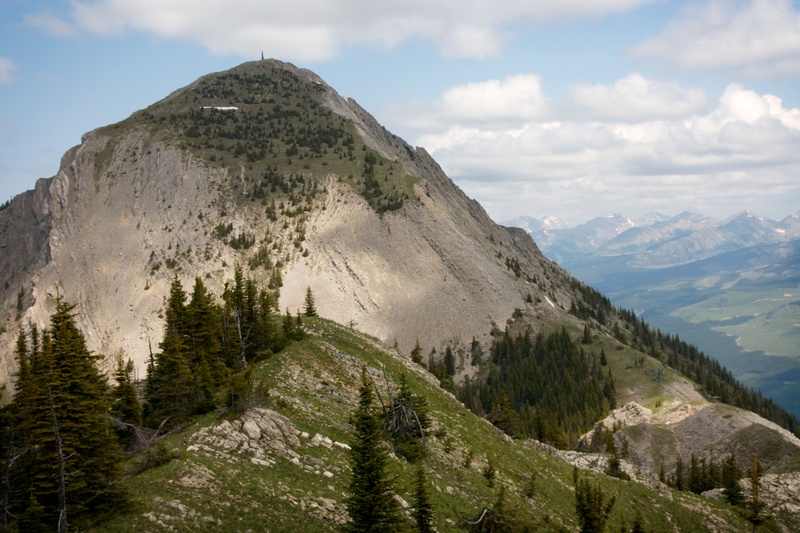 Located just west of Summit Lake on the Alberta/BC border in the Crowsnest Pass (~10km east of Sparwood), Mount Erickson does not see many visitors, though I suspect this has started to change as there are now several recently published trip reports. 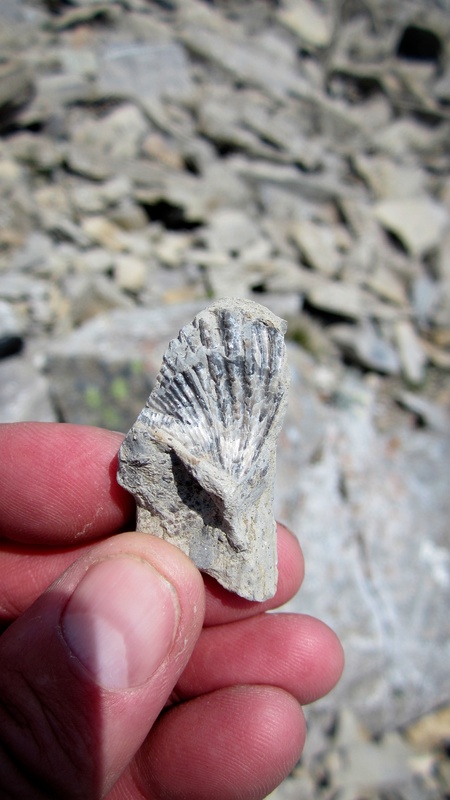 I first learned about the mountain after reading Bob Spirko’s report from 2007 and my interest was piqued after reading Vern Dewit’s report from 2013. 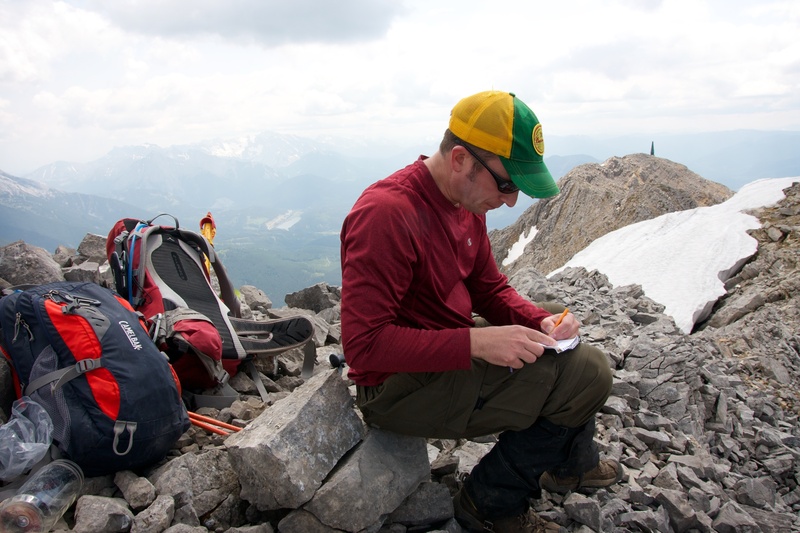 In fact, Vern notes that there had only been 3 entries in the summit register between 2006 and his ascent in June of 2013. If I had been on the ball, I would have counted the exact number of entries over the past year, but I didn’t. 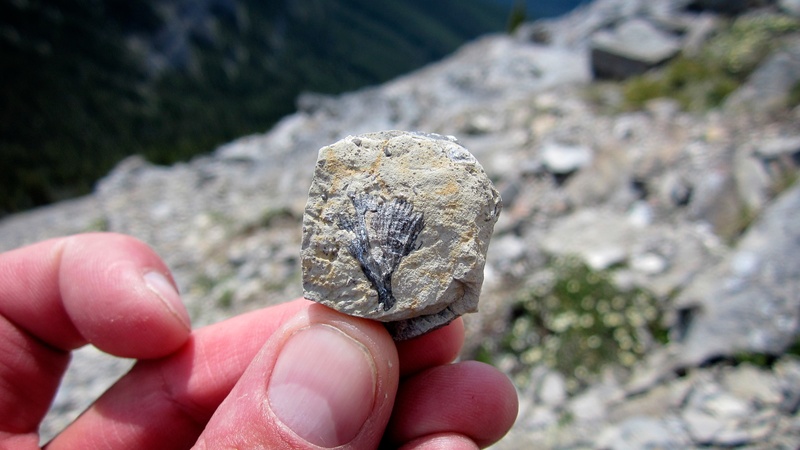 I do remember that there were at least 2 separate parties, with the most recent being from a couple of Teck Coal summer students who had ascended the mountain just a few weeks prior to us. 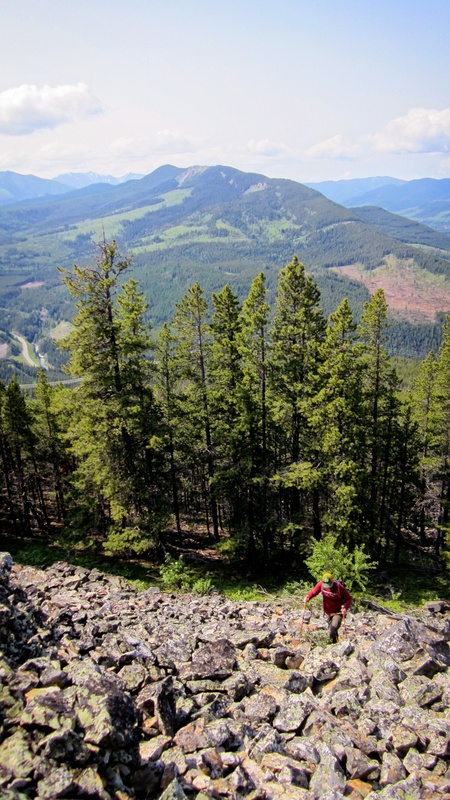 In short, Erickson offers a little bit of everything: varied terrain amidst a long forested approach (if you like trees); some ridge walking; a bit of scrambling; and some interesting views of the Crowsnest Pass which not many people get to see. 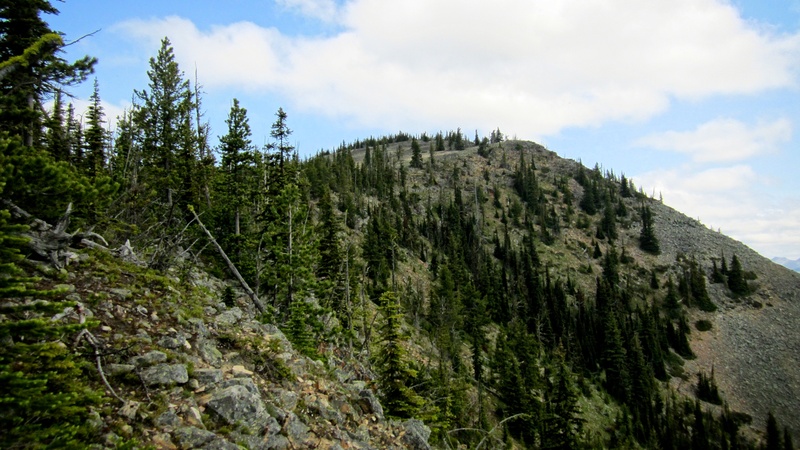 I did however, make the mistake of underestimating the amount of time it would take to complete as the ascent up through the trees to the ridge is deceptively long and does not allow for a quick descent due to several boulder fields. Mount Erickson is readily visible from Summit Lake along Highway 3. 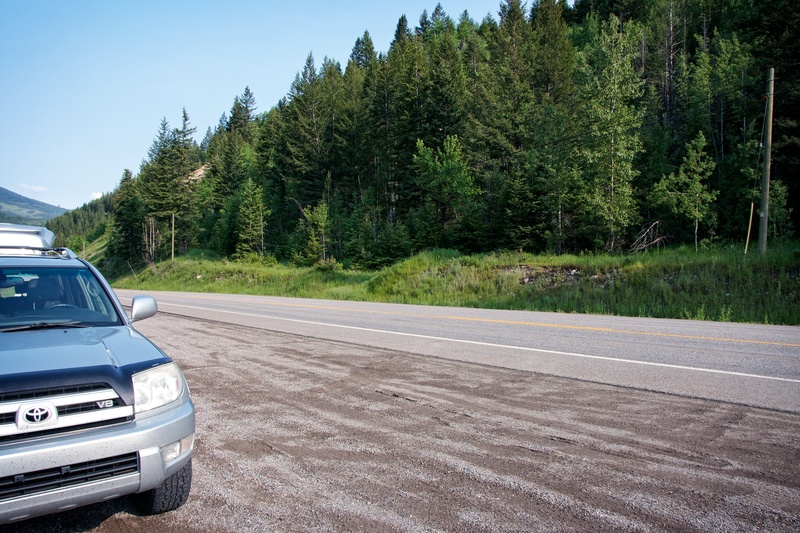 To get to it from Lethbridge, drive west on Highway 3 and cross the border into BC. 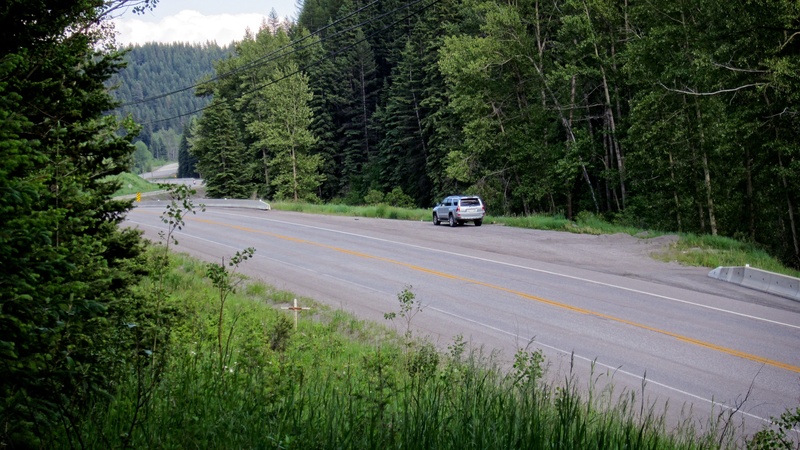 Drive until you reach the first bridge that crosses Alexander Creek, turn around when it’s safe, and park in the first pullout east of the bridge. Do not cross the bridge unless you need to do so to safely turn around. A bit of fishing information: I was recently told by a friend of mine who lives in the Pass, that Summit Lake winter killed this year. This is really unfortunate since the Lake contained some nice-sized rainbows. 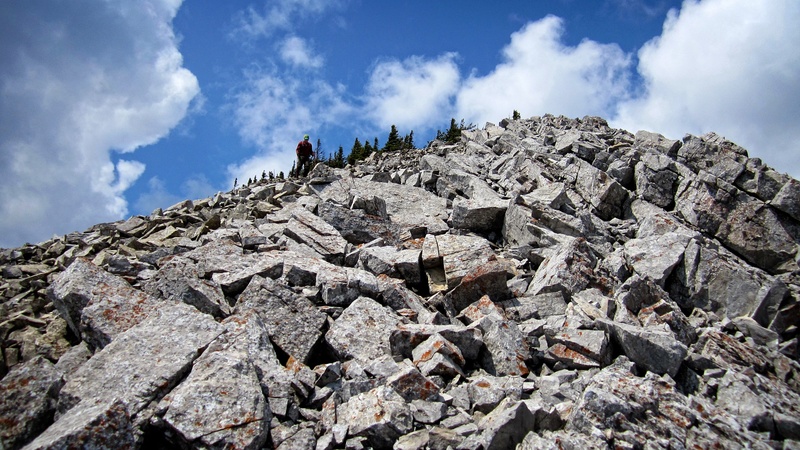 The summit of Mount Erickson lies 6.6km from the highway and though not difficult, it does require more time to complete than you would think. This is partly because the boulder fields require painstakingly careful navigation on descent (I may mention this again). The total distance for our hike was 13.2km with total elevation gains of 1429m. It took us just over 8hrs to complete. Mount Erickson from along Highway 3 near Summit Lake. The summit is obscured by cloud cover. Our route started on the left side of the picture. I’ve added a second map to better show our route. This view is looking to the north from Highway 3. Stay to the east (right) of the obvious drainage gully as this offers the most gradual elevation gains to the ridge. 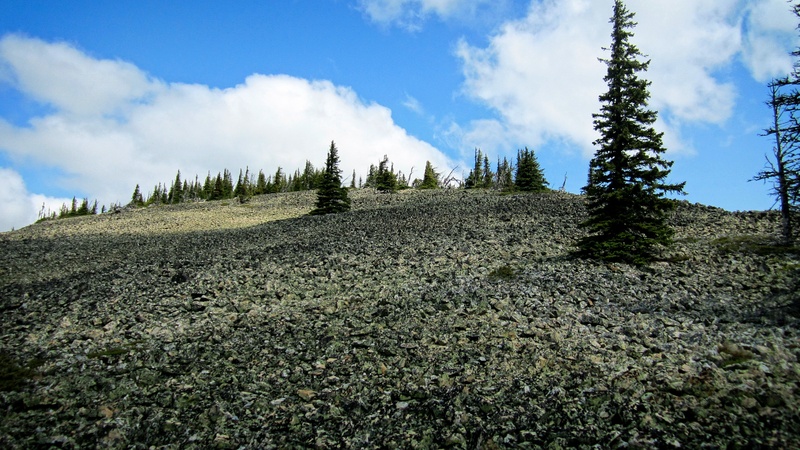 The ridge to the west of the gully may look promising but it would require a steep hike to gain elevation and then a loss of some of this elevation before having to regain it just before the ridge. 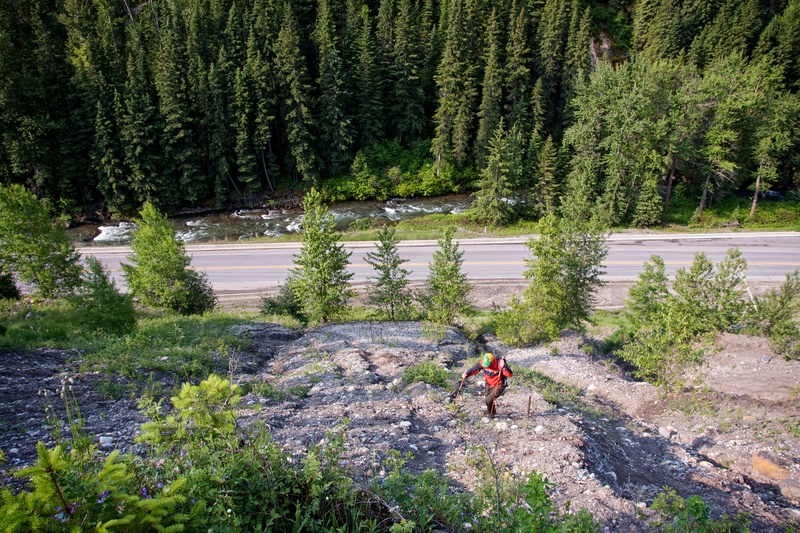 Staying to the east of the gully offers a consistent and more gradual elevation gain. We parked in the pullout just east of the first bridge that crosses Alexander Creek. 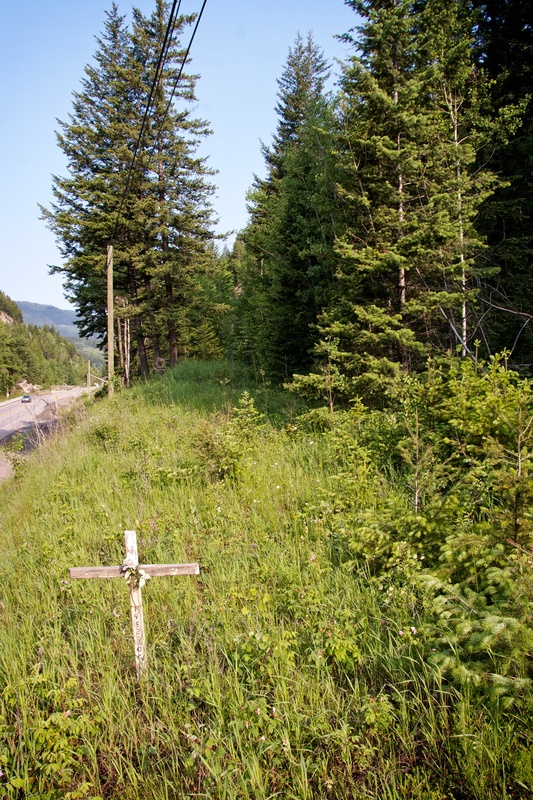 Immediately across from the pullout is a roadside memorial. On the way down we discovered that it is easier to gain the initial ascent slopes by doing a short bit of bushwhacking through the trees that are located directly behind the cross in this picture. 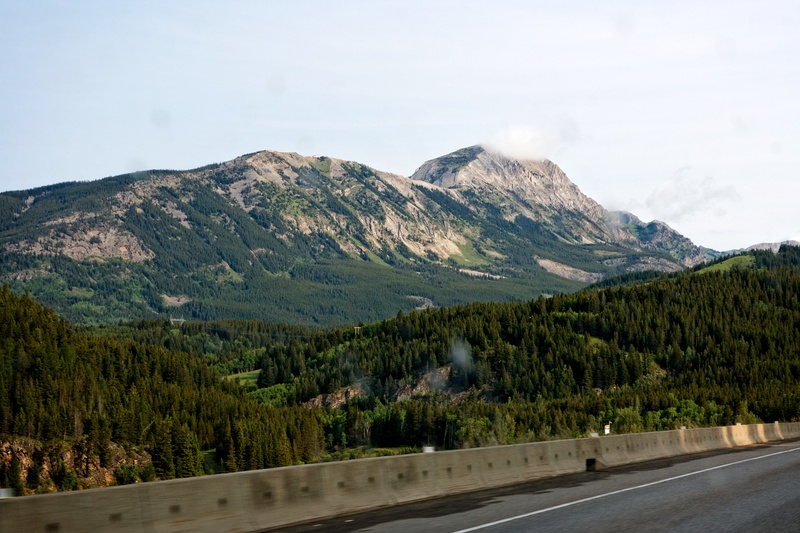 These trees hide a ramp that will cut off some of the more harsh terrain directly above the highway. Jeff makes his way up from Highway 3. Alexander Creek was running a little high, but it was clear and the fishing should be good. 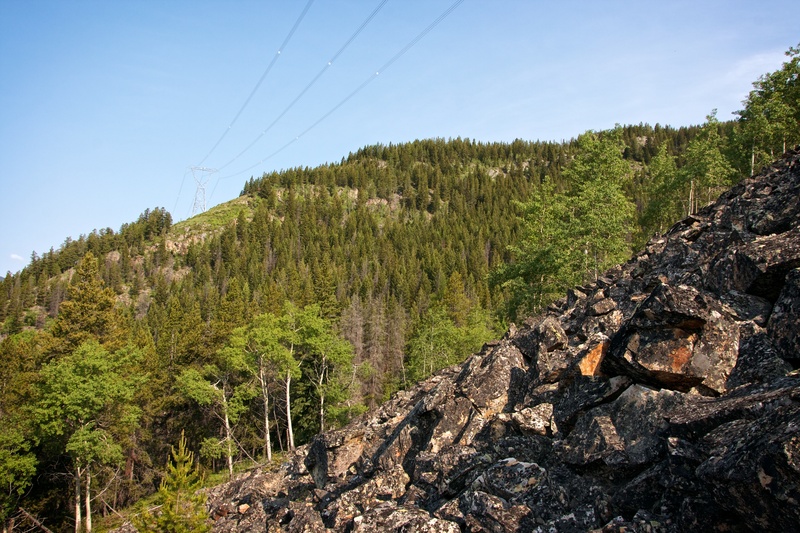 Once up the initial slope from Highway 3, you will come to the first set of power lines. 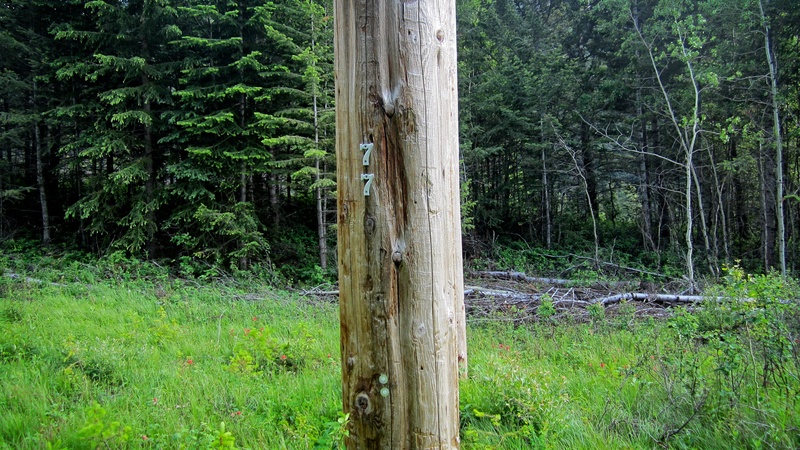 From pole 77 (not to be confused with Route 66), our route continued more or less straight up. Jeff makes his way up a nasty boulder field just below the second set of power lines. Going up and over was not bad, but coming down proved to be time consuming and required great care as many of the rocks were loose. The Natal Fire Lookout is in the background on the left. 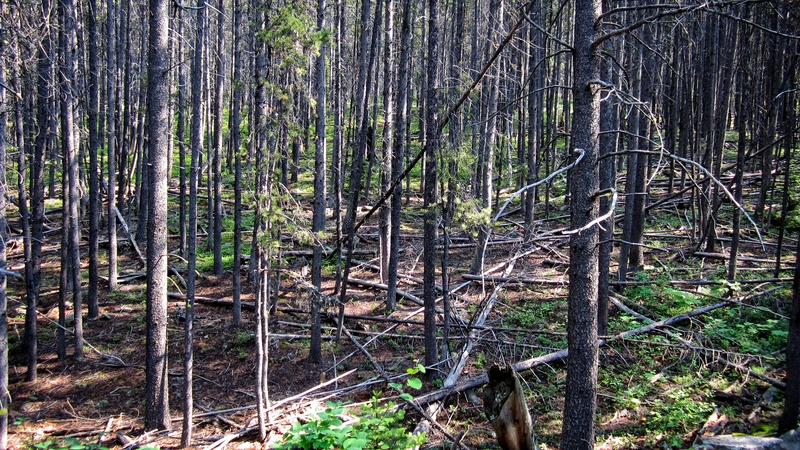 Another shot of some forest terrain. 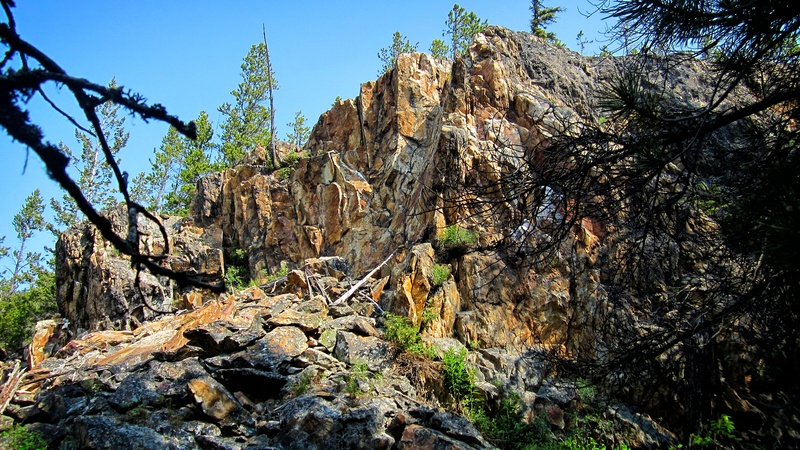 Interspersed in the forest are several rock formations. 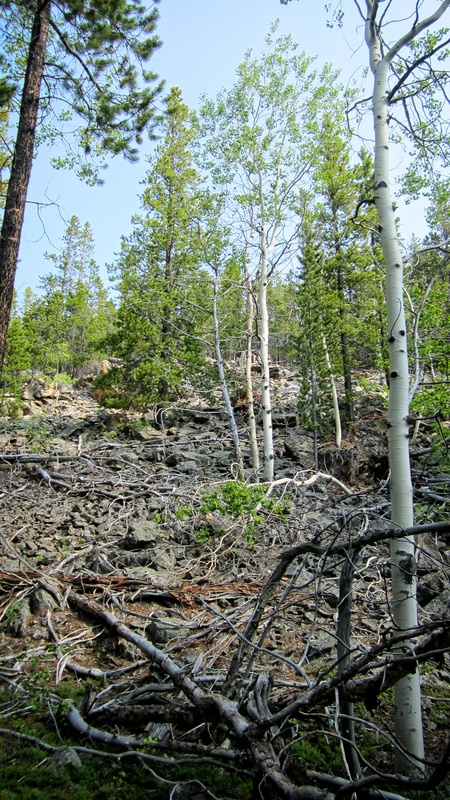 One of several boulder fields on the way up to the ridge. After hiking for quite some time, open spaces finally begin to emerge. Sentry Mountain and the North Ridge of Ptolemy are in the centre, while Island Ridge is in the foreground to the right of centre. 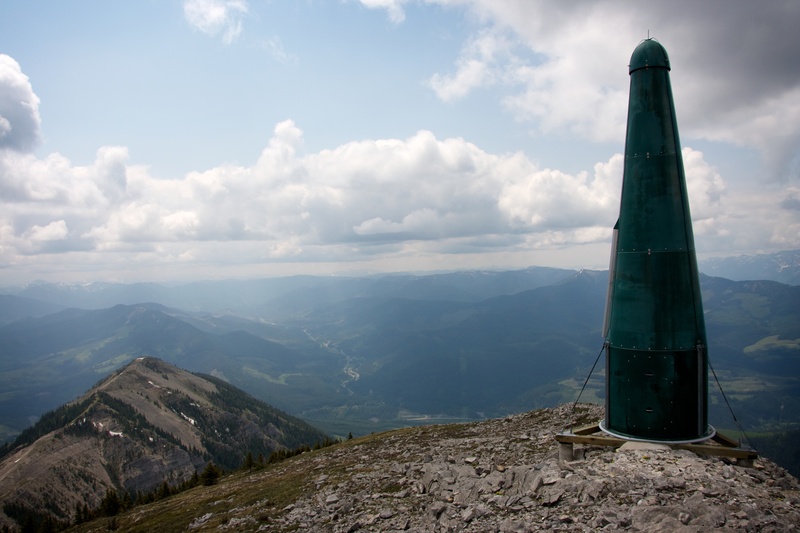 The communications tower on the summit of Crowsnest Ridge can be seen on the left. Jeff makes his way up yet another boulder field. Loop Ridge is in the background. 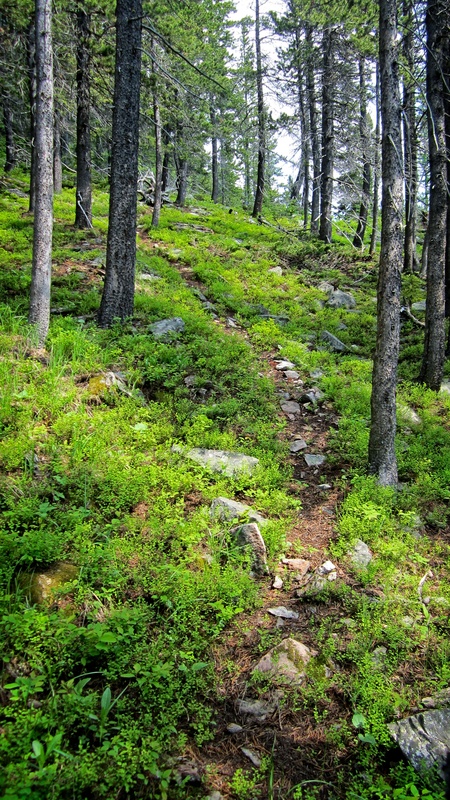 Shortly before reaching the ridge, a number of well used animal trails make for easy travel. However, the only animals that we saw on this day were some marmots, pikas, and a speedy garter snake. 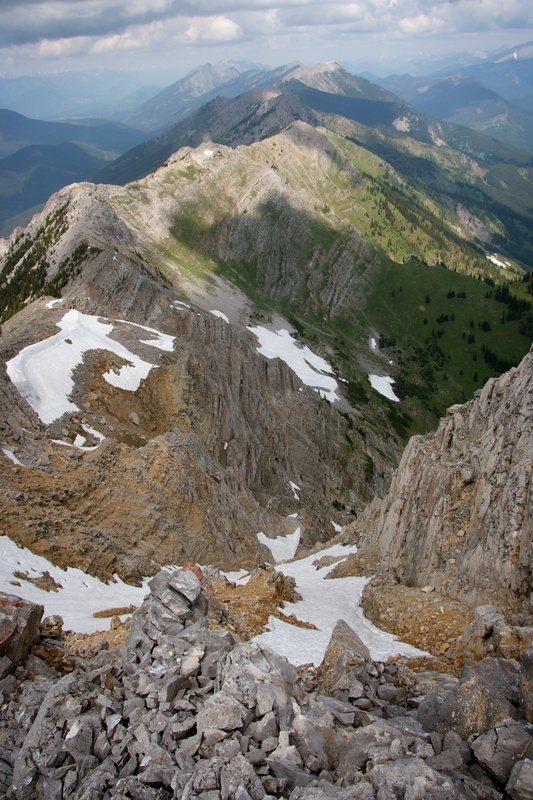 Mount Tecumseh , Phillipps Peak, and “Shooting Star Peak” are in the centre. Mount McLaren and Sentry Mountain on the right. Unfortunately, it was a humid and hazy day, so our views were somewhat obscured. 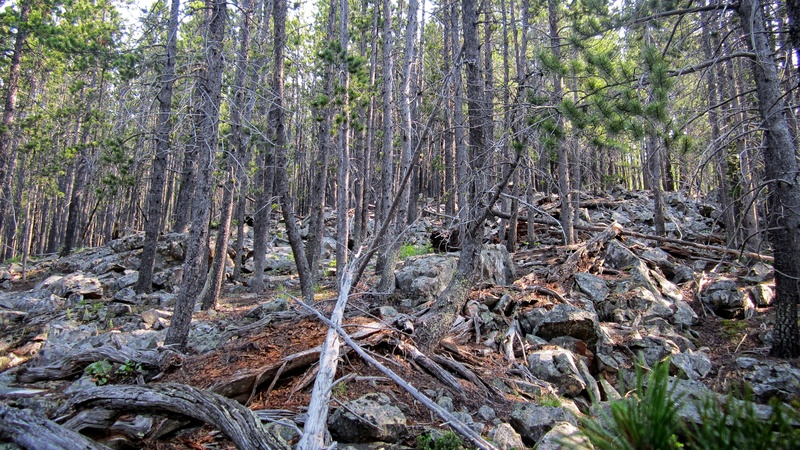 After 2.5 hours of hiking through trees, the top of the ridge finally comes into view. Another boulder field had to be crossed to gain the top of the ridge. 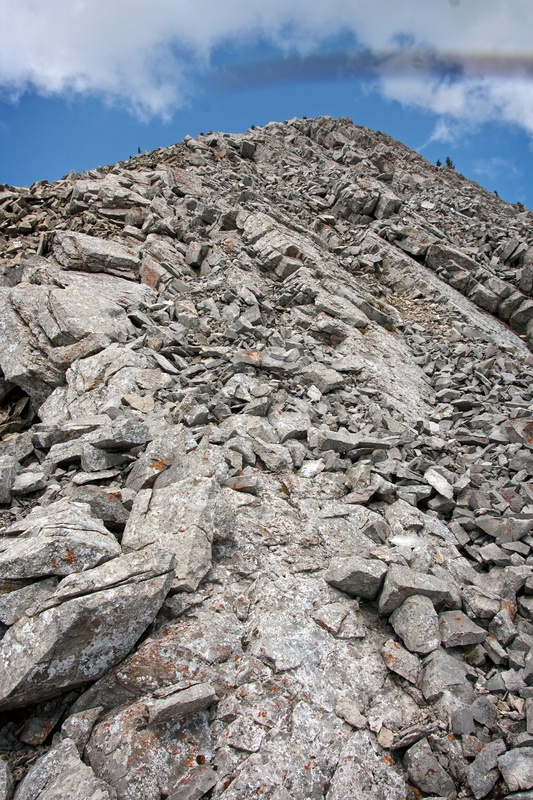 Thankfully, these rocks were significantly smaller than the previous fields, but it still required time to descend. Finally on the ridge, the false summit appears in the distance. After enjoying the views over lunch, we set off for the summit. Looking directly to the east and across the valley at “Alexander Creek Mountain”. 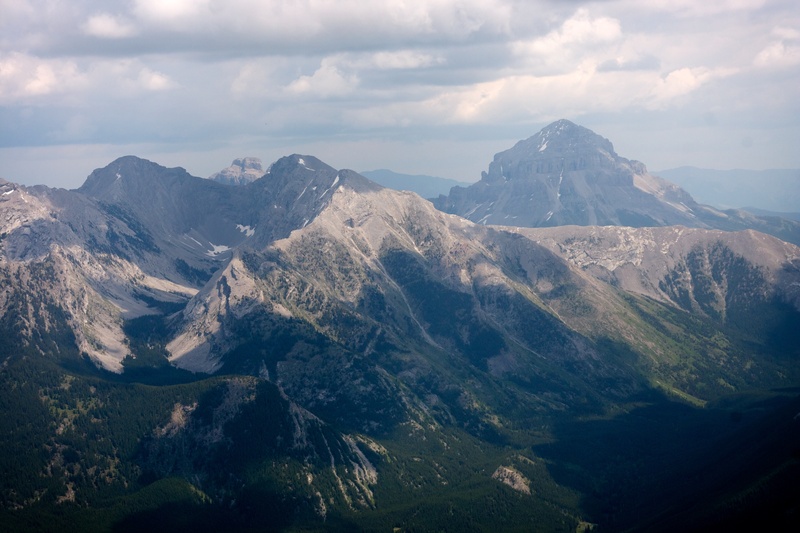 Crowsnest Mountain, the Seven Sisters, and “Deadman Peak” are left of centre and “Shooting Star Peak”, Mount Tecumseh and Phillipps Peak are right of centre. 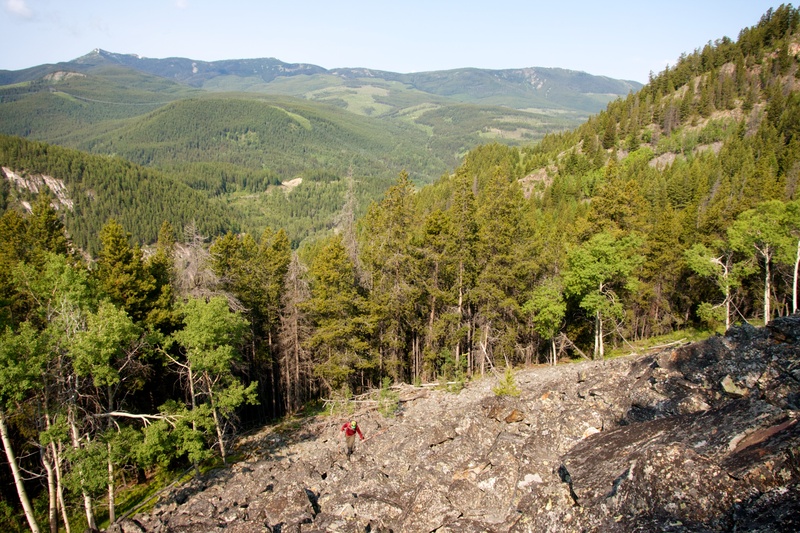 To the west, the Teck Coal company mine on Natal Ridge can be seen. Teck is a major employer for area residents. Jeff makes his way along the ridge towards the col at the bottom of the ascent slope. A communications tower sits on top of the false summit of Mount Erickson. 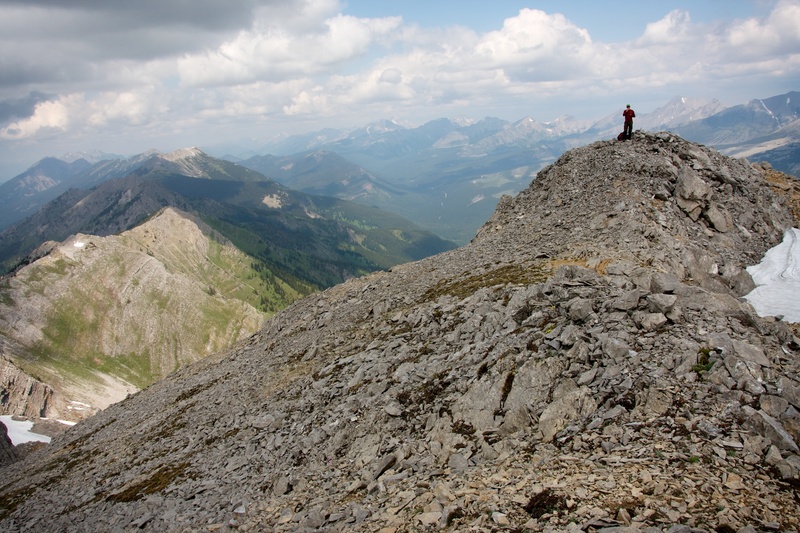 This is the view from the high point along the ridge (2262m). Another view of the false summit and the col between the ridge and the ascent slope. 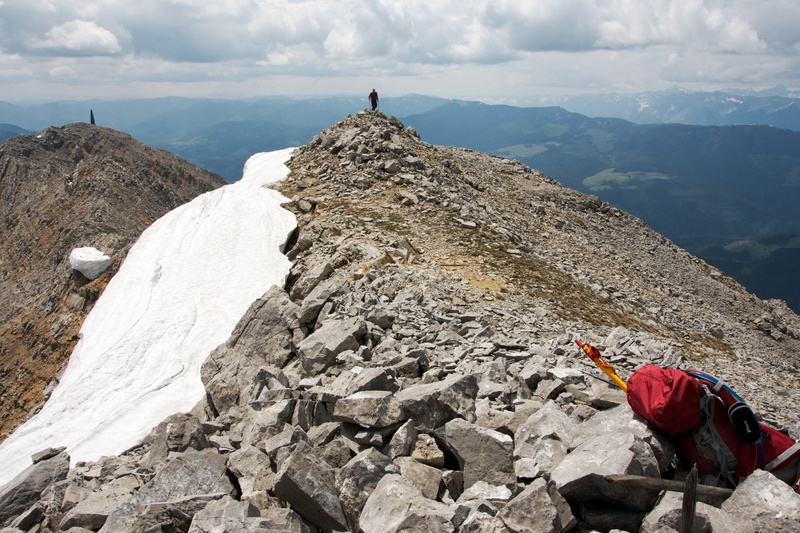 You have to lose about ~80m of elevation between the highest point on the ridge and the lowest point of the col – which also means that you have to regain this on your return. Looking up the ascent slope from the col. 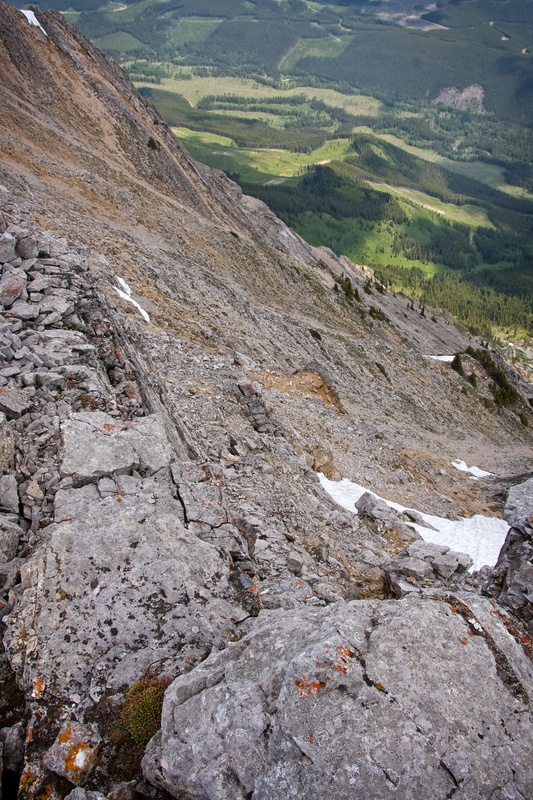 Despite appearances, it is really a short and fairly easy scramble up to the grassy slopes. From there it is little more than a steep hike to the false summit. …and come in a variety of sizes. 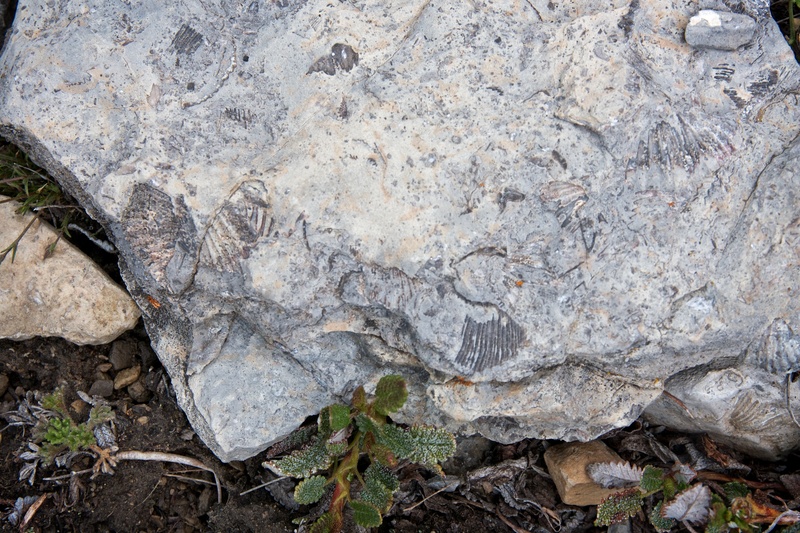 These are just a few examples of the dozens of fossils that we found. 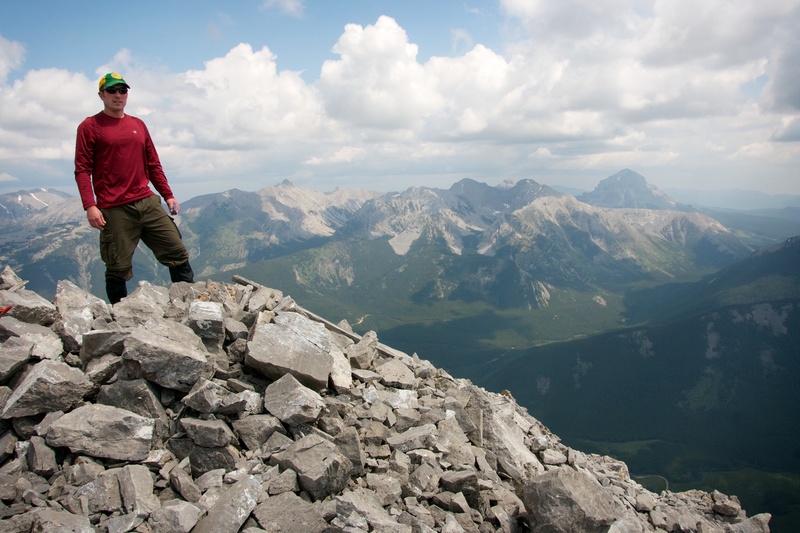 Finally on the false summit of Mount Erectson…, er, I mean, Erickson. Loop Ridge is in the distance on the left. 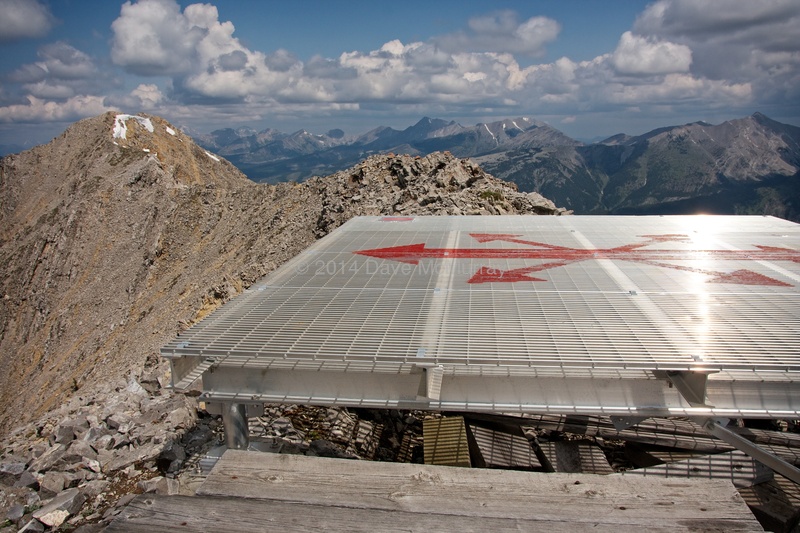 The actual summit is located another 500m to the north of the communications tower. Travel along the ridge to the summit is fairly easy, though it does narrow in places. Looking down to the east from a narrow point along the ridge. The slope on the west side was not as abrupt. Jeff arrives on the summit. 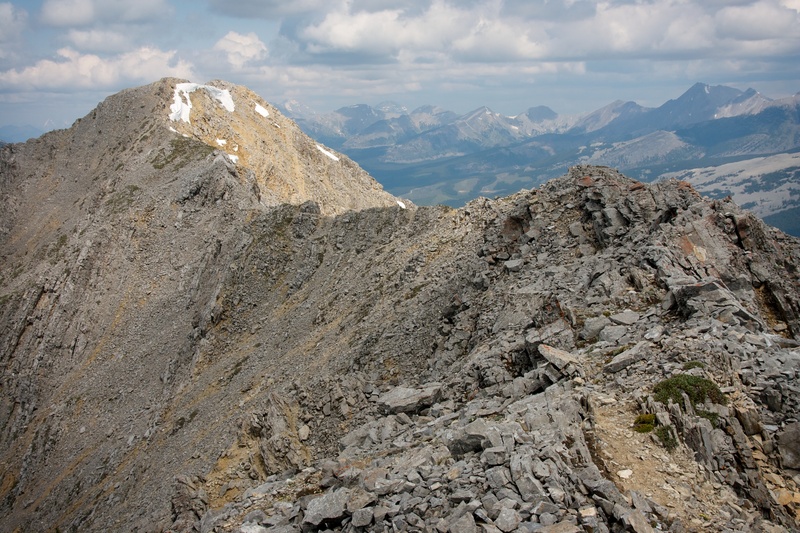 The view to the east includes Allison Peak and “Deadman Peak” on the left and Crowsnest Mountain on the right. The extreme humidity made for hazy views. Another view to the east. 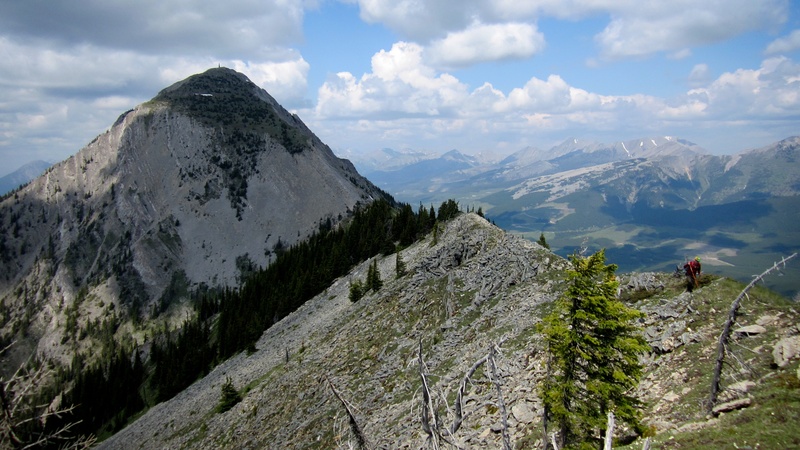 In the foreground is “Alexander Creek Mountain” and behind it are Crowsnest Mountain (left), Phillipps Peak, Mount Tecumseh and “Shooting Star Peak”. 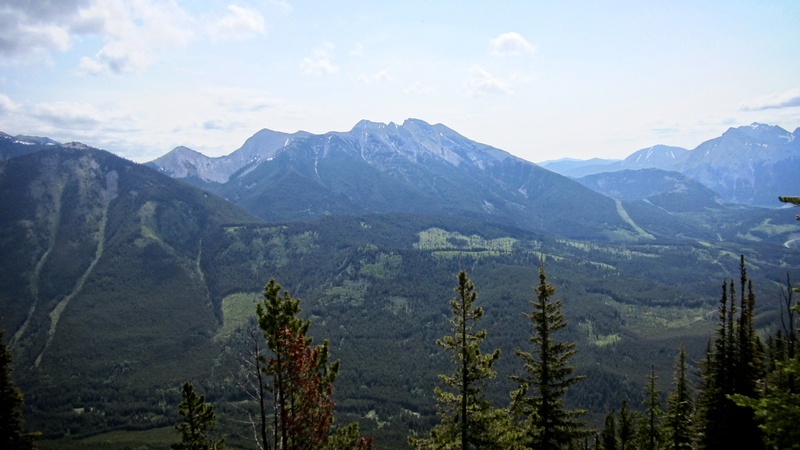 Turtle Mountain can be seen in the distant centre and Mount McLaren and Mount Coulthard can be seen on the distant right. 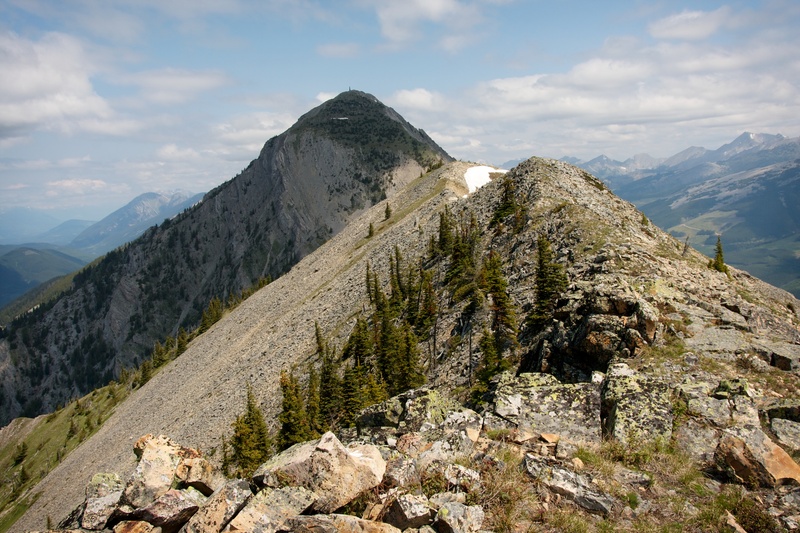 A telephoto of “Deadman Peak” and Crowsnest Mountain. Looking north from the summit along Erickson Ridge. At the far end of the ridge is Gaff Mountain and Sheep Mountain. 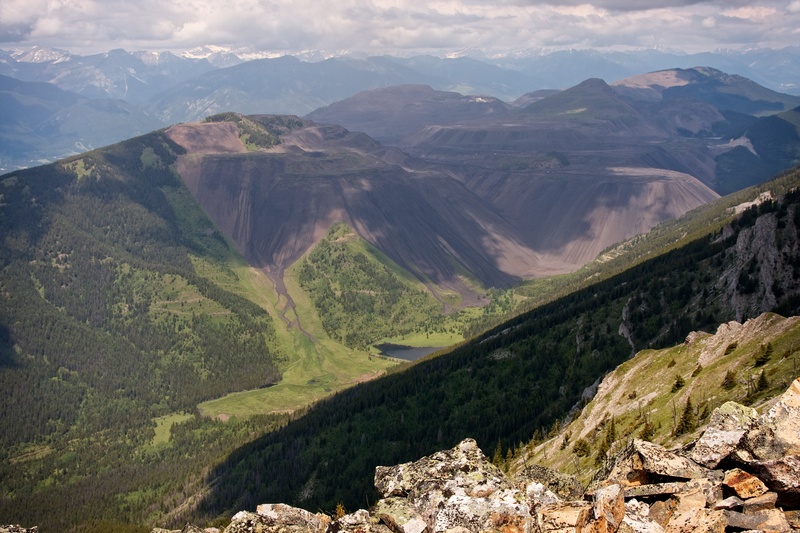 The view to the west is dominated by the Teck Coal operation on Natal Ridge. We could see and hear the constant mining activity during our entire summit stay and even during our time along the ridge. The town of Sparwood can be seen in the distance. Looking to the northeast from the summit. 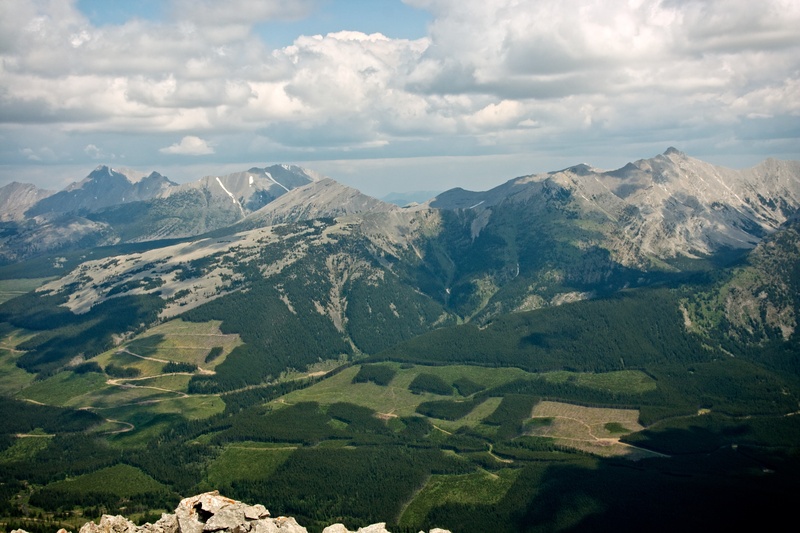 Racehorse Mountain and “Mount Racehorse” are visible to the left of centre, while Mount Ward and Allison Peak are on the right. 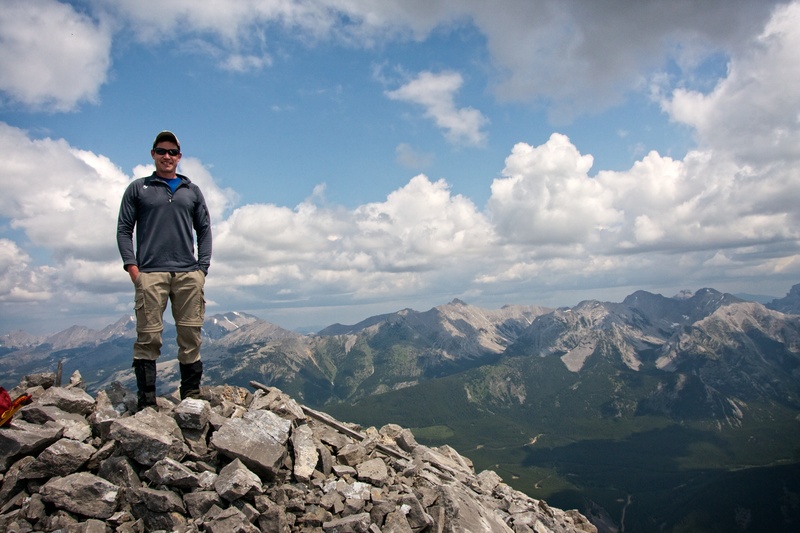 Jeff, who wasn’t feeling great all day but still slogged out an ascent, stands on the summit of Mount Erickson (2485m). Me on the summit. 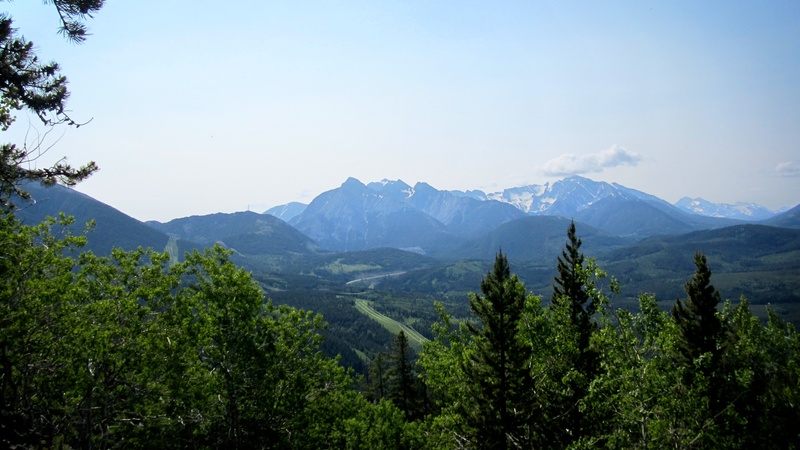 This is a part of the Crowsnest Pass that not many people get to see. 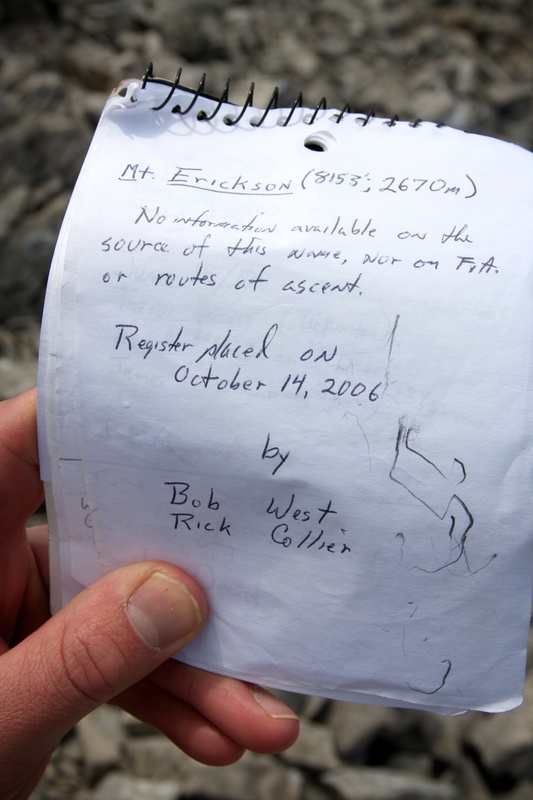 Another register that had been placed by the late Rick Collier. Jeff signs the register. The highly sophisticated plastic Skippy peanut butter jar that houses the register can be seen on the bottom left. As I mentioned earlier, we were the second party to ascend Erickson this month. 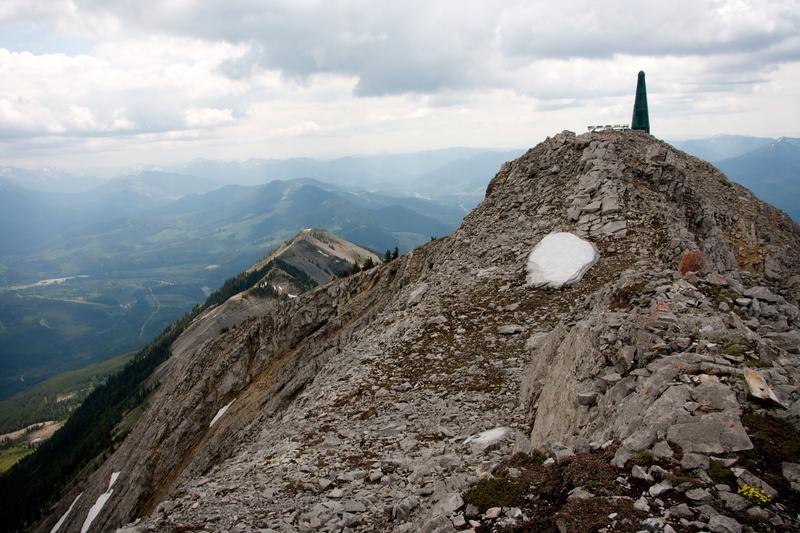 Still, the summit does not see many visitors. Another look to the north from the summit. 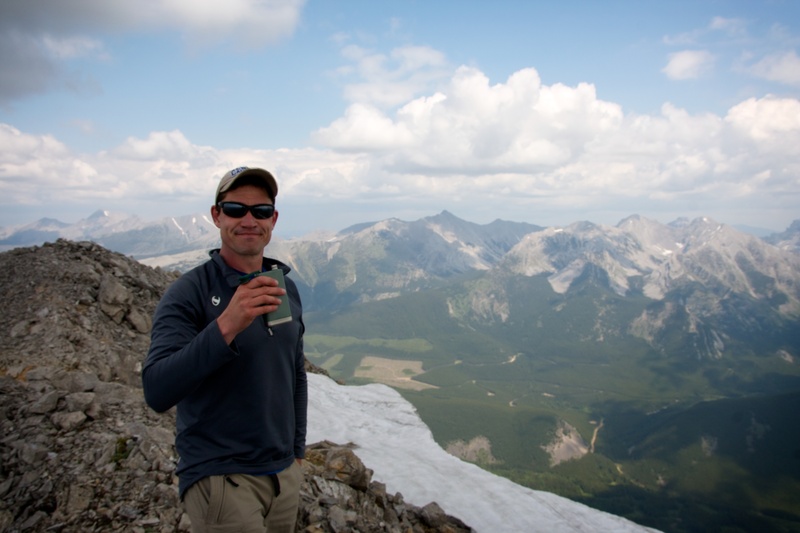 Time for a quick summit toast before we head back. Looking to the south as we head back. 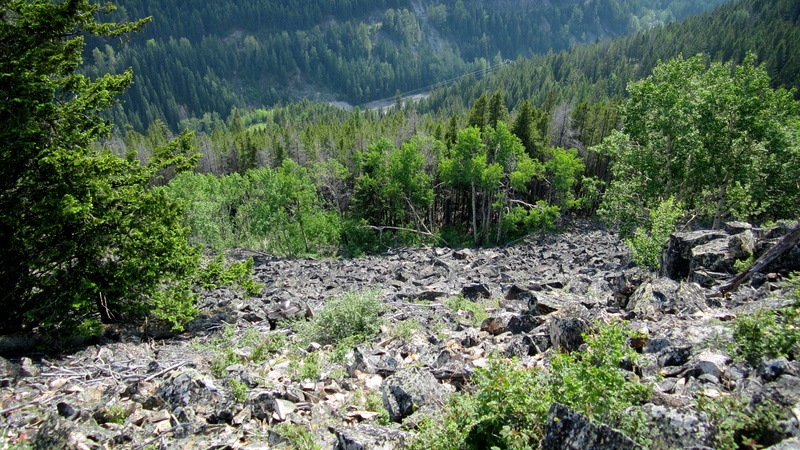 The ridge that we used to get to the base of the false summit can clearly be seen. We weren’t looking forward to having to regain the elevation from the col.
Jeff makes his way down the bottom part of the slope. One last look back at the false summit of Mount Erickson from the ridge. Jeff can be seen on the right. I did not enjoy the trip down Erickson (and neither did Jeff) because there was too much time consumed navigating through boulder fields (Did I mention this before?). Without care, it would be very easy to twist a knee or sprain an ankle as every other boulder seemed to be loose and shifty. This section, just below the second power line, was especially aggravating to descend. 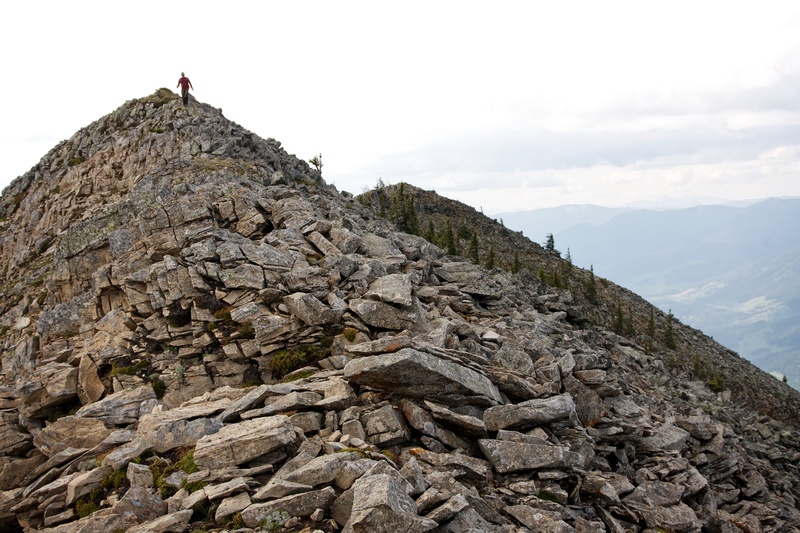 If you decide to climb Erickson, make sure to budget for a slower descent time than you might be used to. After a long day, we emerged from the trees behind the roadside memorial and across from our vehicle. Mount Erickson is an interesting hike and despite the annoying descent (particularly the last 1km), I’m glad that we chose it as our destination for the day. Oh, and be careful crossing the highway!